Don't get Lost! 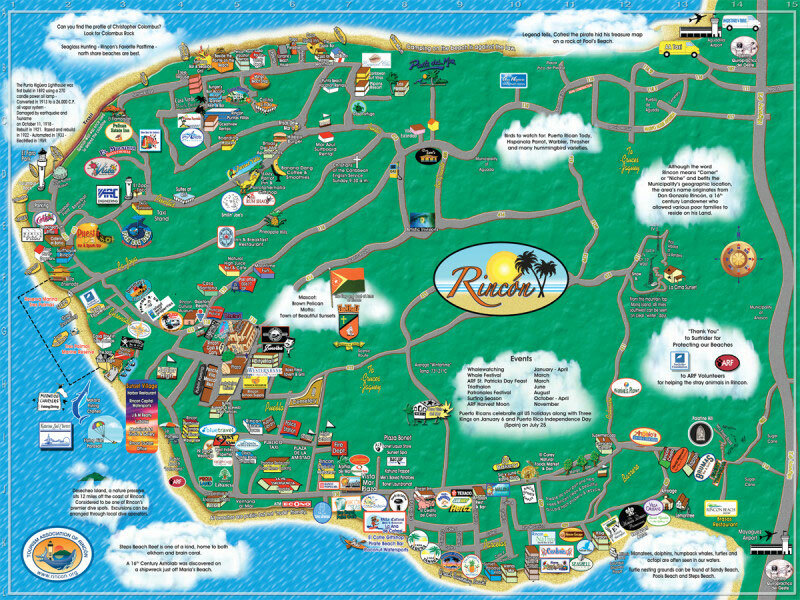 These maps are great ways to find Rincon Businesses and Landmarks! 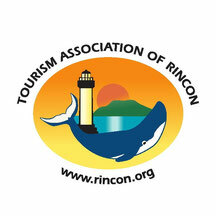 Its even easier to explore Rincón with a copy of our new tourism map produced by the Rincon Map Fund! The easy to use map is for sale at most hotels, guest houses, resorts and shops that are members of the Tourism Association of Rincón, Puerto Rico. Lots of information and easy driving guide for all our member hotels, restaurants and businesses! Copies of the Rincon Tourism Map are only $2.00 plus shipping and will help you plan the best vacation to Rincon possible. Click on the sample map above to get an idea of the map. Want to experience all that Rincón has to offer? 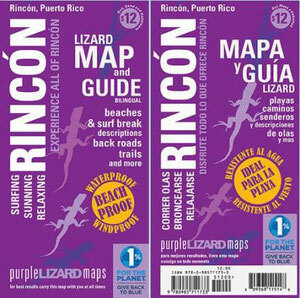 The Purple Lizard Rincón Map & Guide is the key to your Rincón adventures. Purple Lizard Maps publishes the most accurate, detailed and comprehensive map available. The Rincón Map & Guide is a beachproof and waterproof bilingual Map and Guide that clearly identifies Rincón’s beaches, surf breaks, trails and roads complete with contour lines for both topography (land height) and bathymetry (water depth). The Guide side of the map includes detailed descriptions (in both Spanish and English) of surf breaks, written by veteran Rincón surfer Melissa Taylor of Puntas Surf School, plus information about Rincón’s beaches, environment and outdoor recreational activities in Rincón. It’s a big beautiful map, at 2-foot by 3-foot, that is folded to 4x9 inches, and one you will definitely want to have to plan your time in Rincón. Maps can be purchased online at www.purplelizard.com and at local businesses in Rincón.